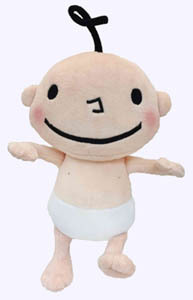 Huggy Kissy Baby Plush Doll: This smiley, lovable baby is ready for lots of hugs and kisses! A round head and a huggable body make this doll perfect for even the smallest hands. Add in rosy cheeks, wide eyes, and a happy smile and you get an ultra sweet, fun, and snuggly companion from play to sleep. Huggy Kissy Baby is 10" tall. Huggy Kissy: When you're an adorable bald baby, your family finds lots of ways to show you how much they love you: Mommy lifts you uppy, Daddy kisses you on the tummy, and everyone wants to snuggle. What's not to love? . Blankie: Anyone who's spent time with a toddler knows that few crises compare with the (even temporary) loss of a favorite blankie. Here, in her humorous, bold graphic style, Leslie Patricelli plays up this scenario, surely near and dear to every toddler's heart. BLANKIE is an affectionate ode to that special object that comforts many a child through the dramas of each day. Potty: There comes a point in a toddler's life when going in one's diaper is only one possible option, and the question must be raised: Should I go in my potty? With pitch-perfect humor and pacing, Leslie Patricelli follows the inner dialogue (sure to have little ones shouting responses) and hilarious actions of everyone's favorite Baby, winding up with an over-the-top look of surprise and delight that will have both parents and offspring laughing out loud. "I did it!" Toot: Everybody does it: Kitty, Doggie, Daddy - even Mommy! And when Leslie Patricelli's beloved bald baby does it while running, it sounds like a train. This frank and very funny look at a certain noisy body function is perfectly suited to the youngest of listeners, while their giggling older siblings will be happy to read it aloud.